Goodlife Cat Food Rating & SAVINGS! Goodlife cat food is manufactured and sold by Mars, Incorporated. 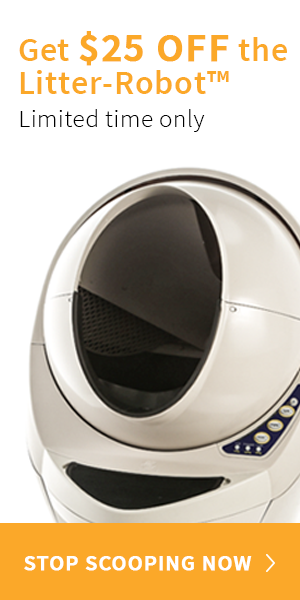 Mars was founded in 1911 by Frank C. Mars in Tacoma, Washington and the company has since acquired a number of pet food brands including Goodlife, Pedigree, Iams, Whiskas, and Royal Canin. Mars is one of the leading food manufacturers in the world and therefore has facilities on every continent (except Antarctica) in more than 74 different countries. The Goodlife website does not state where exactly Goodlife products are manufactured though the Mars websites suggests that it is produced in the USA. ​You may be able to find Goodlife products at local and national pet food chains, but it may be easier to buy them online from pet food retailers like Chewy.com and PetFoodDirect.com. You may also be able to find it in box stores like Target and Walmart. ​Rating: This Goodlife Chicken Recipe receives a rating of 4.4 out of 5 stars. ​All of Goodlife’s products are made with real chicken or salmon as the first ingredient. This is pretty easy for the brand to accomplish since they only offer a total of three different flavors, but it is still an important point to consider. A quick analysis of all three products reveals that chicken is the first ingredient in two recipes and salmon is the first ingredient in the remaining recipe – all three recipes list chicken meal as the second ingredient. While fresh chicken and salmon are excellent sources of animal protein, it is important to remember that fresh meats contain up to 80% water. So, once the whole recipe is cooked down into kibbles, the moisture content will be much lower – this means that the total weight of the ingredient is much lower as well. ​Fortunately, Goodlife makes up for this fact by including chicken meal as the second ingredient. Do not let the word “meal” fool you – chicken meal is simply fresh chicken that has already been cooked down to a moisture content around 10%. This makes it a much more highly concentrated source of animal protein than fresh chicken. 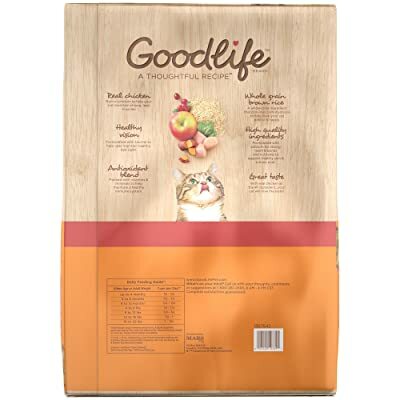 ​So, the fact that chicken meal is listed as the second ingredient indicates that Goodlife products are very high in animal protein which is incredibly important for a healthy and nutritious diet for cats. The second claim Goodlife makes about its foods is that they are free from corn, soy, and wheat ingredients. This is very important because not only are corn, soy, and wheat ingredients often low in nutritional value, but they are also very difficult for your cat’s body to digest. Instead of using these ingredients, all three Goodlife recipes include brown rice as the third ingredient. On their website, Goodlife suggests that each of their products contains natural fiber to control hairballs. It is safe to assume that they are referring to the brown rice as the source of fiber, though all three recipes also contain dried fruits and vegetables. Brown rice is one of the most digestible grains, but it is still a grain so it will be harder for your cat to digest than other gluten- and grain-free carbohydrates. 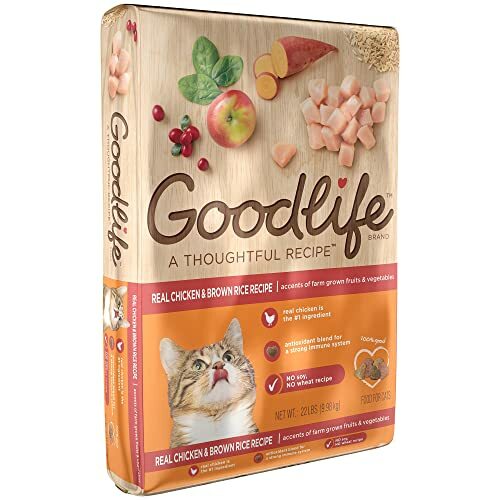 Goodlife suggests that all of their products are made with high-quality ingredients and formulated to meet your cat’s nutritional needs. Each of the three products is supplemented with calcium to provide support for healthy bones and teeth as well as other nutrients for a shiny coat and healthy skin. Unfortunately, there are several questionable ingredients included in Goodlife recipes which brings this claim into question. Brewer’s rice, for example, is another grain that consists of broken fragments of rice kernels. These kernels are supposedly easy to digest, though they are low in nutrients – it is likely included as an additional source of fiber in Goodlife foods. Some other questionable ingredients include dried beet pulp, powdered cellulose, and brewers dried yeast. Powdered cellulose is included in the Indoor Recipe and it is a carbohydrate as well as a good source of fiber. Dried beet pulp is another source of fiber though it is otherwise fairly low in nutritional value. Brewers dried yeast is a byproduct of the beer brewing process and it does contain some nutrients. Many cat food manufacturers include it in their recipes because it has been shown to help repel fleas. ​The final claim Goodlife makes about their products is “great taste”. The inclusion of fresh meats and meat meals will certainly contribute to the natural flavor of Goodlife products. It is worth noting, however, that all three Goodlife recipes contain an additive called “natural flavor”. While this may sound like a good ingredient, it is difficult to know exactly what “natural flavor” is and it is hard to judge the quality. In some cases, natural flavor is simply another name for MSG. It cannot be said for sure that natural flavor is a bad ingredient, but it would be better if it came from a named source like “natural chicken flavor”. You have already learned a few details about Goodlife’s cat food recipes and all three of their formulas are made with a similar list of ingredients. The inclusion of real chicken and chicken meal as the top two ingredients makes this formula protein-rich – it also contains chicken by-product meal as the fourth ingredient. It is somewhat troubling to see brown rice, a grain, included in the formula in addition to some questionable carbohydrates such as brewer’s rice and brewer’s dried yeast. This formula does contain some dried fruits and vegetables as well as vitamin and mineral supplements, though they are not chelated so your cat won’t be able to absorb them as effectively as they would nutrients from natural sources. This formula is free from corn, soy, and wheat but it does contain several sources of carbohydrate including one grain and it also includes added flavors and colors. It is also somewhat troubling that the Goodlife website doesn’t provide any details about how or where the product is manufactured. ​CHICKEN, CHICKEN MEAL, BROWN RICE, CHICKEN BY-PRODUCT MEAL, BREWERS RICE, ANIMAL FAT (PRESERVED WITH MIXED TOCOPHEROLS), NATURAL FLAVOR, BREWERS DRIED YEAST, POTASSIUM CHLORIDE, DRIED PEAS, SALT, ADDED COLOR, TAURINE, DL-METHIONINE, DRIED SPINACH, DRIED TOMATO, DRIED BLUEBERRY, DRIED SWEET POTATO, DRIED APPLE, DRIED CRANBERRY, CHOLINE CHLORIDE, DRIED CARROTS, MIXED TOCOPHEROLS (A PRESERVATIVE), VITAMINS (VITAMIN E SUPPLEMENT, NIACIN, VITAMIN A SUPPLEMENT, VITAMIN B12 SUPPLEMENT, THIAMINE MONONITRATE [VITAMIN B1], RIBOFLAVIN SUPPLEMENT [VITAMIN B2], D-CALCIUM PANTOTHENATE, PYRIDOXINE HYDROCHLORIDE [VITAMIN B6], VITAMIN D3 SUPPLEMENT, FOLIC ACID, BIOTIN), MINERALS (ZINC SULFATE, COPPER SULFATE, MANGANESE SULFATE, POTASSIUM IODIDE), YUCCA SCHIDIGERA EXTRACT.